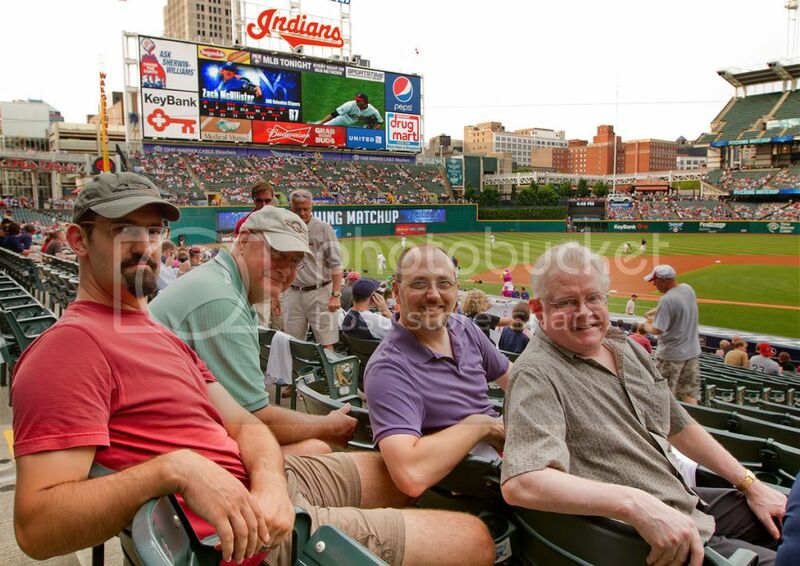 Last week Peter, Tom, Jack, Ray and myself got together in Cleveland. We took in an Indians game, The Rock and Roll Hall of Fame, and spent way too much time at Fatheads Brewery and Saloon. The Indians game was fun, though we left just before a game-winning grand slam from Hafner. Damn! Though had we stayed, Fathead's kitchen would have been closed! The Rock and Roll Hall of Fame was a very pleasant surprise for me, as the website didn't have me expecting all that much. But to see John Lennon's and Jimi Hendrix's handwritten lyrics to iconic songs, etc. was really great. And Jack's depth of knowledge and stories from years as a musician made me feel like we were touring the facility with a historian of the genre. We also had a wonderful experience at two friends of Jacks: Bruce and Jan. Their friendship goes back to their teens, and Bruce and Jack have played onstage together on and off for 50 years! They have a beautiful dream home and Jan put out an amazing spread! A wonderful time was had by all, evidence of which is the fact that hardly any time was spent silently listening to music or watching movies, but rather conversing about the meaning of life, music and beer! Sounds awesome. Wish I could have been there. I want some of that weather back. It's ridiculous in VA right now. You guys get storm damage last night? There was a tree across the main road in our subdivision this AM. At first I assumed you were just moaning about the high temps, and I was going to call you a temp wimp, but I figured I'd better check what "ridiculous" meant first. I was talking mostly about the humidity and temperature, but the second crazy thunderstorm in one month qualifies as ridiculous, too. No storm damage here, though I could swear my fence was going to fly away at one point. Just a bunch of leaves and small branches down. OK. So you're a temp wimp. Best for you not to venture further south. I cannot tell you what a fabulous time we had. I have not laughed so much in years. My sincere thanks to all who traveled so far so I could show them my town. Cleveland is just about like any other place in the world. There are good things about it and there are bad things about it. Regrettably, most of the good things are rarely mentioned in the media. It is my hope they left with a better image of Cleveland than the one with which they arrived. Did you NOT see my new SIG line? Regrettably, I wasn't there. It was great talking to you guys through Skype though! I hope this gathering happens again soon...I WILL be there...whether you like it or not! I did not. Hey, I'm old & slow (but VERY cool ).